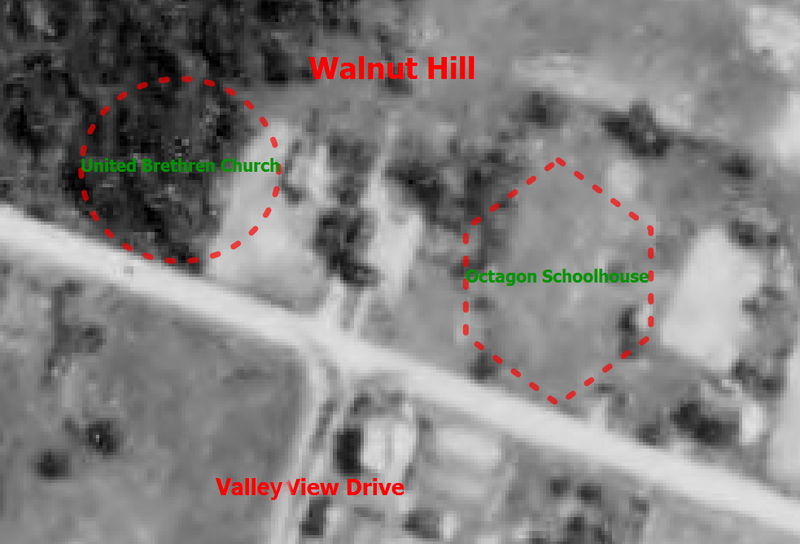 I'm back with you here folks, to present an in depth post on the little known Walnut Hill area of Upper Tyrone and Bullskin townships and the historic connections it has to the Braddock Road and, possible associations to the Turkey Foot Road. Please read on for some interesting observations and surprising conclusions. Part of the Walnut Hill area is in Pennsville of Bullskin Township, the other part in Upper Tyrone Township, and both are in Fayette County, Pennsylvania. This is above where George's Trading Post is near Crossroads. To help give directions for more distant travelers, from the south is the next one to the left past the Rt. 119 Everson exit. From the north, the second turn off to the right, past the Mt. Pleasant exit. As the Pennsville area was settled very early, the only place around the region this ancient is probably the borough of Mount Pleasant. Accordingly, Franklin Ellis' book, "The History Of Fayette County" on page 497, claims the Pennsville settlement once had twenty-one families, (at least as many, and maybe more than now). In May of 1837, it was voted on to build the octagon schoolhouse, so this was, apparently considered as coming into their jurisdiction. I don't know just when this school was replaced by others to the west in Kingview and Kifertown and how this was used in conjunction with the school houses round about Pennsville. 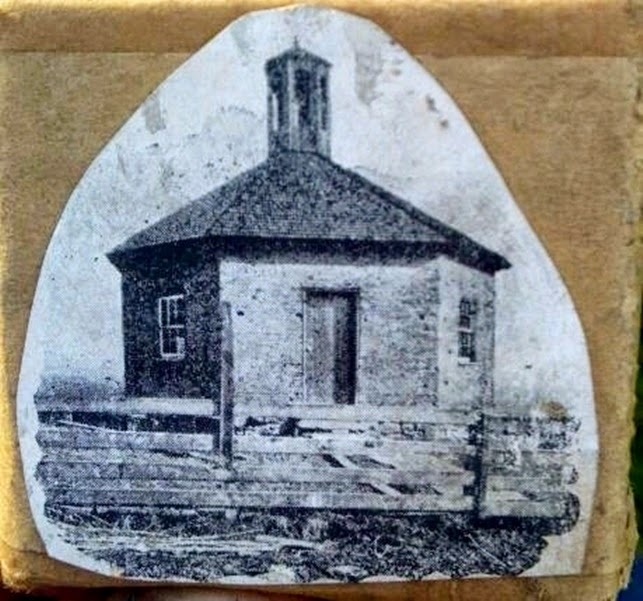 In what was termed the 'First Half District', was the somewhat mysterious 'octagon' schoolhouse and an old United Brethren church where Isaiah Potter and sometimes, Rev. Powers preached. Dr. John R. King, born in Normalville in 1866, (according to the "History Of The Allegheny Conference of the United Brethren Of Christ", by J. S. Fulton), attended the Mt. Pleasant Institute and was converted at the old Walnut Hill church and was united in service for that church. The Everson Evangelical church was said to be an out growth of the Walnut church in the late 1890's. Both the old school and church have long since vanished. On the same page of Ellis' book about the population, we have "This house was on the Tyrone line, west of Pennsville and was a prominent landmark in its day." Which makes it even more interesting as so very precious little information is known concerning it. Sarah Ullery and Henry Ullery, a family name that has lived nearby, may well of been a teacher there, the same might be said of Elijah Yunkin, and possibly even Lulu Longanecker, as she taught for some time at the hamlet of Kingview. In 1900, as well as South Everson and McClure. Francis Hill was a teacher listed at the school. According to the Daily Courier, Sept. 26, 1905 pg. 5, the First Institute of the Upper Tyrone Teachers was to be held in October at the Walnut Hill school house with teachers, patrons, and other friends of education invited to attend. This would allow for some evidence of it's prominence. After the fording of the Youghiogheny River at Stewart's Crossing the Braddock Road headed over the hills through the Narrows along the border of the two township lines through an old road that is broken up for the railroad. It soon travels right past on the west of the Mennonite graveyard, (coordinates, 40.073882, -79.579090), on a branch of the Catawba Path at the intersection of Sherrick and Bradish Roads where once was the Mennonite Meeting house. Here one will have arrived at the location of the old Mennonite Cemetery, a place covered in my last post. From here the Braddock Road segment veered away from Mount East north toward Valley View Drive. You can see on the cropped colored map above, the 'coal lands' might of endangered traces of the BR east of Valley View. What remains is covered as a projected heading for the route to Walnut Hill on what is known as the Kingview Road or the A1035 road, which runs easterly to Pennsville and west to Scottdale. 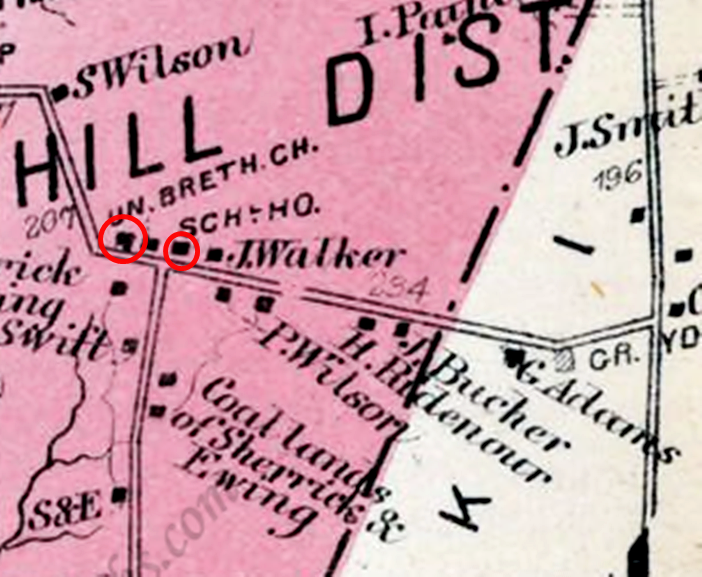 The Crossroads, to the north of Pennsville, strictly speaking, are to the east of Walnut Hill as well, where the road turns left before turning right, but this relation does not factor into the directional equation because of a more modern origin. The point I'm making here, is the Kingview Road clearly ran unimpeded to the Country Club Road. So, the older road, which I will point out soon, traveled straight down what isWalnut Hill, to where today, is that same road entrance. These beelines can be significant, as when farmland and trees join as a part of a trace linking an old tract. For there, the Braddock Road was plotted by some researchers to turned north, running somewhat close to the Rice School Road and on the northerly part for a way, where there are possible scars still to be observed, but nothing definitive is known. Then it adhered to a rough extent to Rose Road as it traveled more northerly still to Gimlet Hill and the Green Lick Dam. This is my understanding of it. For more information on the 'New Dam', click the underlined link. Now, what is also interesting, the Turkey Foot Road appears to of followed the Braddock Road from Wooddale in the other direction toward the Rice School Road from the south in an effort to avoid Iron Bridge and the 'Great Swamp' located there. As it may of followed the Braddock Road route, it would then of ascended Walnut Hill and diverting up to the top of the hill where there is an old road trace from a 1939 overhead photo. This is as much as it can be enlarged for the supplied Blog format, so please click on it for a better view. Tell me, do you spot the old road trace? Any feedback you can provide will be appreciated! More on this train of thought in a moment. As a secondary alternative, I speculate the 'TFR' could of crossed through the small Rankin Creek valley, as it came westerly up what became the Prittstown Road. This would calculate to the advantage of a more direct route, circling on lower ground around the steep elevation of what is locally called Penny Hill, which would necessitate being skirted. For another reason which I will get to in a minute, I favor the plausibility of the Walnut Hill route. 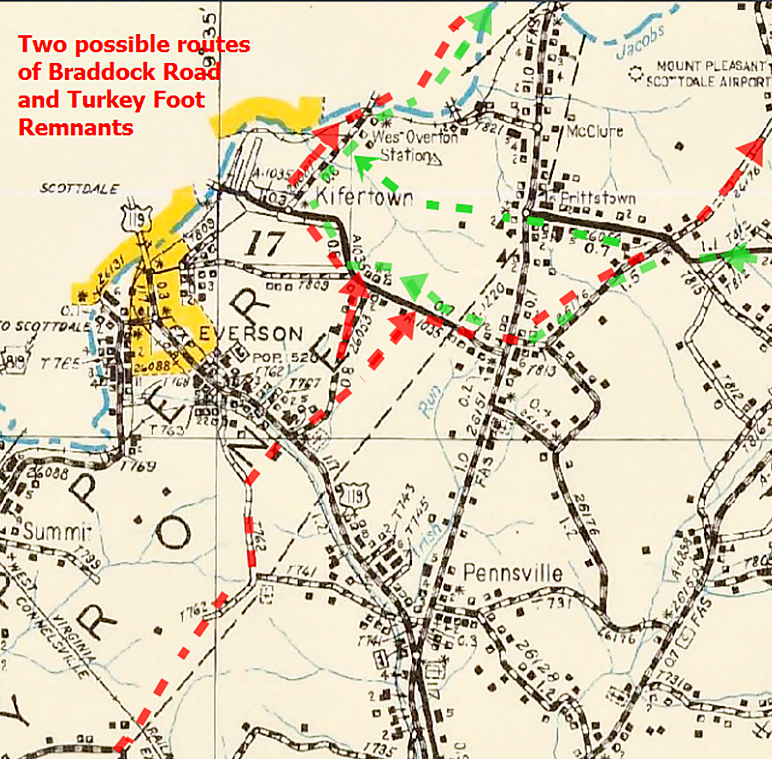 I would issue a small word of caution that some of my article is still on the order of estimation, with some proof from map reading, as quite possibly, a part of the Turkey Foot Road used the extension of the Braddock Road. With the route of the Braddock Road near Kingview, we are, admittedly on firmer ground. Consequently, I feel a near surety these two famous routes simply crossed over and through there, navigating around this hill, one down and one up. Kingview and Dexter are places I am still looking at and investigating more thoroughly as of this moment, as I find the quality time. I will keep be sure to keep you all posted. Please be patient with research works that are in progress. Any discovery of this type is made more difficult as anyone who is familiar with the area knows, with the complications of farming, mining and logging roads that were continually laid in here in their hey day and left their marks and scars to blend with the modern era changes. Even more so, the strip mining that took place from the large Connellsville Coal Bed that under ran the whole region and has done much to deface these historic traces. 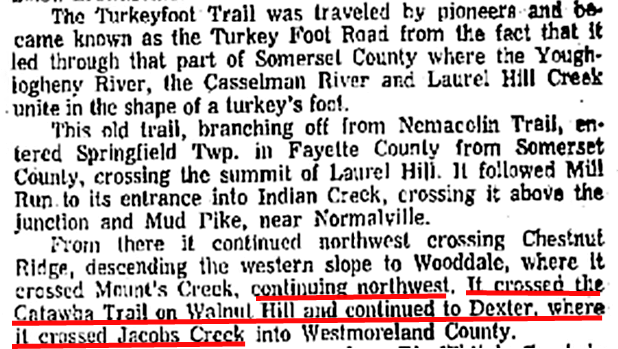 Since the Turkey Foot Road was said to of crossed Jacobs Creek near Dexter and onward toward Mt. Pleasant, possibly using as a part of the old Turkey Path, this needs to be checked out as much as humanly possible in the near future. To further this theory, we have some maps of various ages to help with orientation. According to my calculations, between the Rice School Road and Walnut Hill, the 'BR' and the 'TFR' would of crossed each other. Though, this statement only holds feasible if the projected research is in the main, correct. This is well within the realm of probability. (As mentioned elsewhere, part of the supposition is not without another, though less likely, alternate route of the Turkey Foot Road, south of McClure). Below, you will note what I present as the major factor to favor this route of the Turkey Foot Road. Mr. Mosier, a Waynesburg college professor, was a Vice Principal of a Syracuse school in New York and a Supervisor of the schools in the Uniontown area. Also, he was the one time President of the Westmoreland-Fayette Historical Society and his claims should not be taken too lightly. Here, from the 1939 photo, is noted the course of the Braddock Road antecedent before modern realignment. 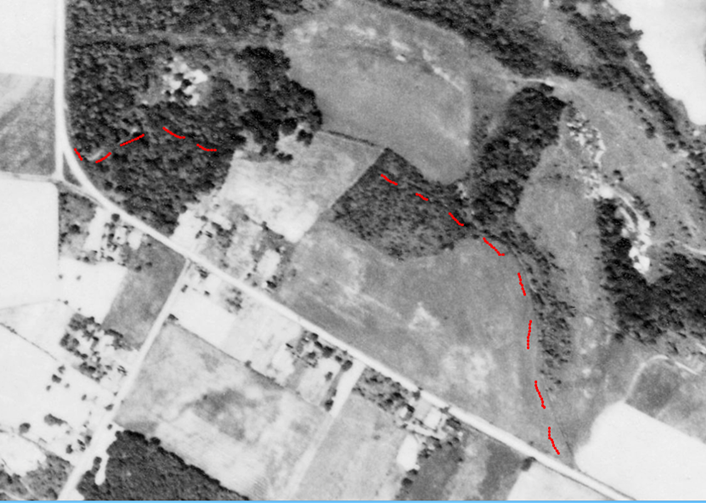 Above is the old road, probably a part of Braddock's Road, I located from the 1939 black and white photo with locational coordinates where the modern road changes course at 40.090291, -79.560148. Approximately, thirty to forty yards below here is where the newer version of Route 119 bisects the township line north and south. Therefore the new Rt. 119 parallels old 119 of the Pennsville, or Richey Road. Again, the only other likelihood to this route or alternative at hand, would be for the TFR heading through an area near Prittstown and subsequently to of entered the hollow of Rankin's Creek just south of Penny Hill and thereby heading to a segment of what would become Dexter Road. This was in the pre-industrial days, before Stauffer's saw and grist mills built on what became their farmland, bought from the original warranty and patent holders. There would still be the required crossing or fording of Jacob's Creek at Dexter which could not be avoided, as pointed out in Veech's book as a mile below the chain bridge, ( at modern Iron Bridge). As Lannie Dietle has calculated, this area is south of West Overton near the Stauffer or Overton Station and saw mill area of the Stauffer coke ovens and part of the Dexter Mine Works near the turn of the last century. Here we find the Jacob Creek Bridge. I would prefer to highlight that place in the future even more clearly. Providence Mounts, a captain and major of the militia, was prominent in clearing the TFR in Fayette County, and lived for some years near Connellsville. He was elected a justice of the peace for the area of Westmoreland County, Sept. 15, 1780, per George Dallas Albert, in his book on page 453. This was three years before the separating of Fayette County from Westmoreland after the Pennsylvania and Virginia land controversy and the resolution of the Mason Dixon Line. He was, of course, a major figurehead here too, along with men like Isaac Meason, the largest landowner around, and George Hogg. I could, tentatively speculate toward the inclusion of some relatives of mine, such as Adam Hatfield, John Miner and possibly Adam Flick, (also a Revolutionary War soldier), in capacities as Justice of the Peace, and Overseers of the Poor, and Supervisors of the roads, etc., with the instructions given from General to Colonel, passed on down the chain of command to lay out roads in these areas. This is documented in Washington's journals. I must draw the line right there, having at hand no real evidence of ancestral involvement beyond the efforts of Providence Mounts to sustain such a theory than my conjectures and speculation. 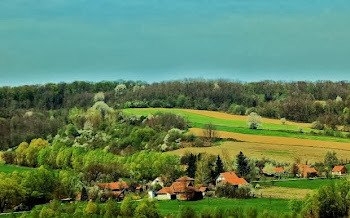 Thus, in what became Fayette, in the, then, larger township of Bullskin, and once large township of Upper Tyrone and in Dunbar, Isaac Meason, a principal landowner, held offices toward Uniontown, and all these type of men were heavily and directly involved in shaping the region. Much responsibility and territory was associated with his jurisdiction. Notice must be given that Fayette did not become a separate county until 1783. For more detailed information of most other regions beyond this, of the Turkey Foot Road route itself, please check with the well documented book, "In Search Of The Turkey Foot Road", by Lannie Dietle and Mike McKenzie, and you will find much detailed research to ponder over and learn of. May I add, the learned gentleman also has expressed a degree of approval, with some added support toward the possibility of these famous roads intersecting each other. It is likely, he will deliver some weight on the issue. As of right now, he may have much on his plate with a letter I forwarded to him of a man with, apparently, convincing evidence of remnants of the Turkey Foot Road near to Quail Road in Bullskin township. I give this research material out to the public rather tentatively, and in between collecting, photographing, and gathering material for other concentrated posts I am deeply concerned with at this time. I will want to consider including more indirect, though meaningful evidence and/or documentation up 'around the bend'. This will be when I can get a breather! 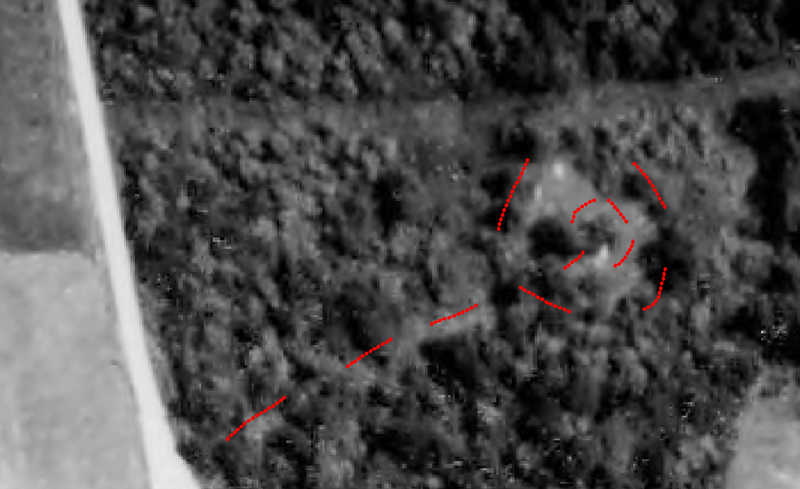 So, theoretically, with some fairly substantial documentation, we are confronted with what appear important remnants adjoining the Country Club Road from Walnut Hill, traveling the very area the Braddock Road traversed and quite near to where the Turkey Foot Road of a few years later, would of extended close to. Here I have located an abandoned road on the side of that hill following the contoured incline.This is what I call fascinating stuff, folks. Where am I going with this, you may inquire? Well, we'll see, but I feel as the website gains steam, more perceptive observations ride on it's coattails. These signposts of historical relevance need to be noticed and addressed as they light the dim reaches of our forgotten days, finding a serious purpose in your readership to enlighten our path forward and what treasures has been lying right behind us all along. In my eagerness to provide some tantalizing clues toward the further discovery of these famous roads of antiquity, I consider this a sister post to the last one on a lost or abandoned road near the Mt. East region of South Everson where Braddock's army crossed through. Please have a look at it too. Coincidentally, this was about an area only a relatively small distance south of the location referred to in this, my most recent post. These articles and their content, literally and figuratively, need to be followed up on soon with more exciting revelations of our past.